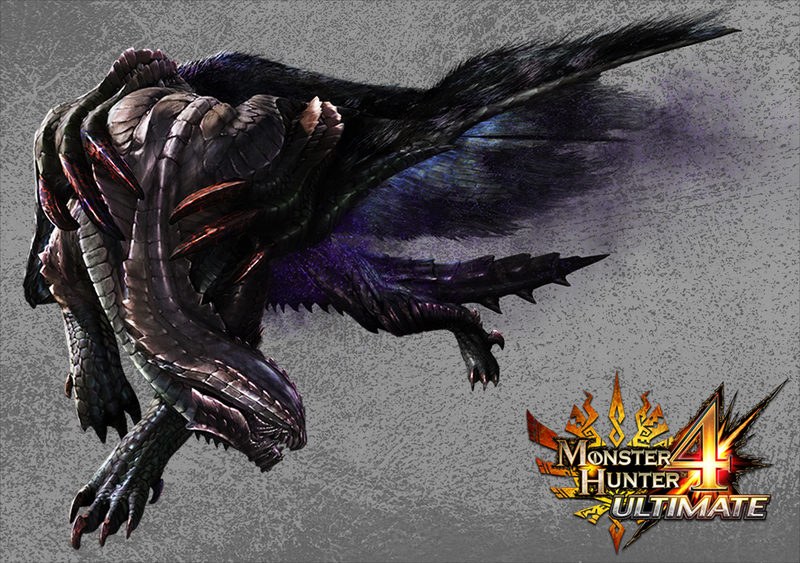 This week we dive into Monster Hunter 4 Ultimate’s flagship monster, the Gore Magala! I also go to great lengths to detail the new feral wyvern status in this week’s article. Come and check it out! 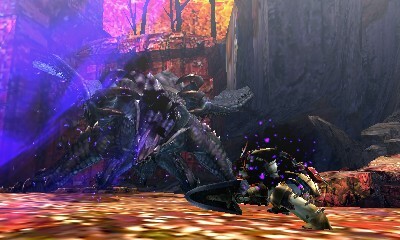 The Gore Magala is the flagship beast for Monster Hunter 4 Ultimate. It has six limbs, though two of them only come out when it’s in its frenzy mode. In lieu of eyes there are heat-sensing patches, making it look like something to come out of Aliens. It’s easily my favourite of the fourth generation monsters, and rivals the Zinogre for the spot of my all-time favourite fight. The Gore Magala lacks an official classification, being listed as a “?? ?” monster. It’s the juvenile form of an elder dragon called the Shagaru Magara, which I’ll cover in two weeks. It’s weak to fire, lightning and dragon attacks, and is capable of inflicting the feral wyvern status effect. It can go into a “frenzy mode” during the fight, which is different to it simply being enraged. I’ll start by going over a few of its attacks before moving on to the feral wyvern status and its frenzy mode, both of which it shares with Shagaru Magara. 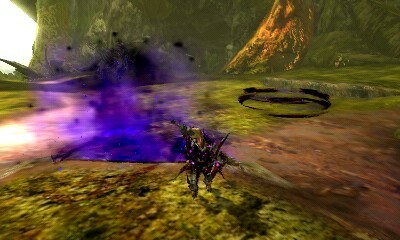 The Gore Magala can shoot purple balls across the ground in three different directions, which will disappear after a short time. They get fired off to the left and to the right before curving around to its front, as a third gets fired directly ahead of it. It has another attack where it fires a projectile behind the hunter, which after a short time will explode into a trio of projectiles to take the hunter by surprise. Black lines can be seen poking out of the initial ball, pointing out the direction the trio will be heading in, so use these to avoid them. The Gore Magala can charge the hunter across the map. It also has an attack where it suddenly lashes out with ones of its arms, which if it lands will result in the hunter being picked up and tossed around by the beast. 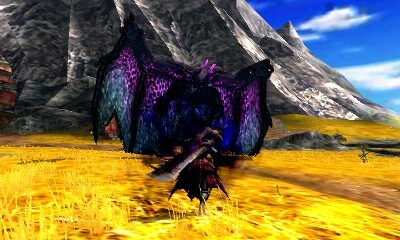 Feral wyvern is unique to the Gore Magala and the Shagaru Magala. The hunter can be afflicted in a few different ways. The Gore Magala is blind, but can leave some of its scales on the ground to help it perceive its surroundings, which manifest in dark purple to black circles on the ground. This is the method that infects me the most, as running through the circles doesn’t deal any damage so I don’t see a real incentive to avoid them. 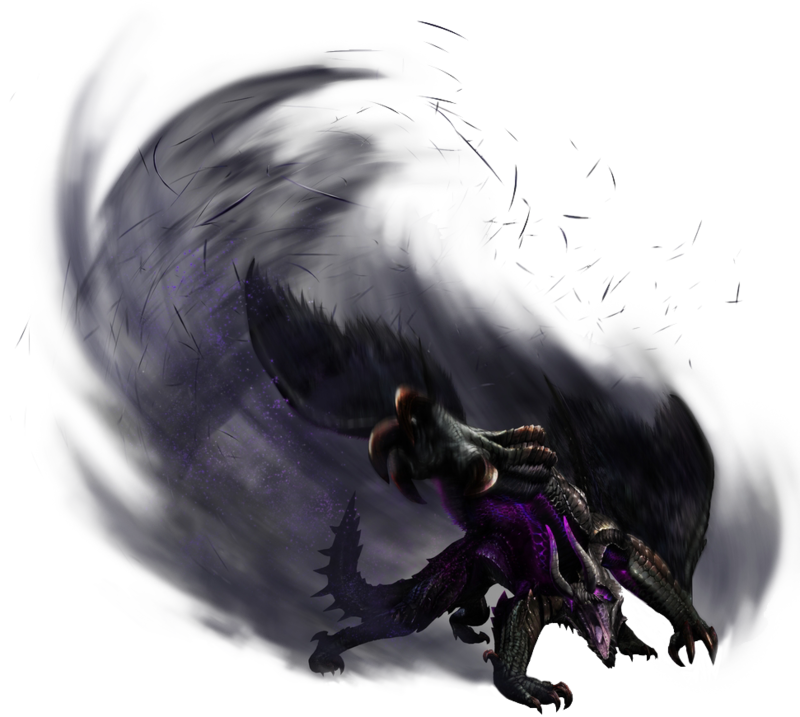 Getting hit by a projectile will also give the hunter the status, and when the Gore Magala is in frenzy mode, some of its melee attacks will inflict the status as well. Once affected by the virus, a purple bar will appear underneath your health which shows how much the virus has progressed. It can be stalled by eating a nulberry, which will drop the progression of the virus by half the total bar. Should the virus’ progression reach the end of the bar and take hold of the hunter, they will be unable to regenerate health and their defence will drop significantly. At this point, the only options are to wait for it to wear out or to sleep it off. As such, it may puzzle you to hear that I often intentionally infect myself with the virus. I get affected by the scaly circles on the ground the most because I run into them on purpose. You see, if you deal enough damage to the monster you’re fighting when you have the virus, you’ll be granted an immunity from it and also experience a rise in your affinity for a short time. This is also why the Gore Magala’s weapons have such a huge amount of affinity. Here, you can see the purple status bar beneath the hunter’s health bar. 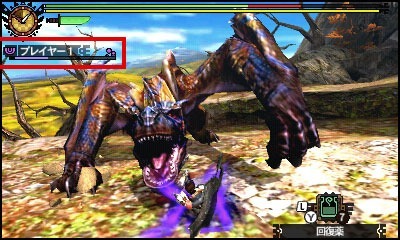 The feral wyvern virus can affect other monsters. You’ll find in Monster Hunter 4 Ultimate that you’ll occasionally have to fight infected monsters, and they can give you the virus if they hit you. Monsters infected by the virus are noticeably more powerful, faster, and more aggressive. So much more aggressive. You don’t even know. Something to look forward to, right? 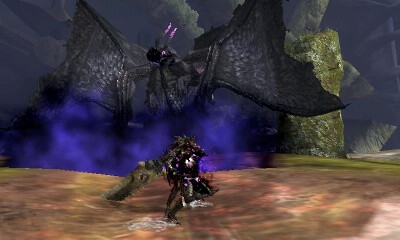 When the Gore Magala (or any monster infected with feral wyvern) is tired, it drools a black substance. 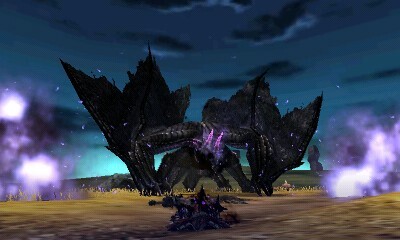 The Gore Magala will then fly away to feast on the nearest herbivore to regain its stamina. It’s worth noting that any monster inflicted with the feral wyvern virus will spend less time being exhausted. The Gore Magala’s wings will change steadily from blue to purple as you fight it due to an increase in its own perception. After it hits its peak, it will enter a frenzy mode, and a pair of (breakable) horns will stand up on its head. This is the only time these horns can be broken. Other breakable parts include its head (separate to the horns; it leaves a scar on its face), arms and wings. The tail can also be severed. 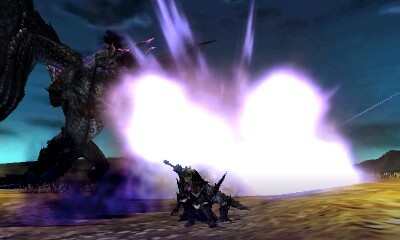 Frenzy mode is truly unique to the Gore Magala and the Shagaru Magara, and is not something transferable to other monsters like the feral wyvern virus is. When it enters this mode, the area around it darkens and it becomes more powerful. The arms it before kept tucked into its wings come out to play, showing off its six limbs where before it was only using four. Keep in mind, this is separate to it being in rage mode. So it can become enraged while it’s in frenzy mode, which is a whole new world of terror. While in this mode, it gains a few new attacks. It’s able to create exploding pillars of a purple substance in front of it. These will either fan out sideways, or in front of it away from the head. It also gains a physical attack in which it slams its feet on to the ground as it moves forwards, before rearing up and doing a final slam with two feet. The last one in particular is easy to avoid, as there’s a large amount of time between the time it rears up and the time it does the damage. The Gore Magala cannot be prevented from entering this mode; it just happens with time. The best you can do is hit it till it dies breaks out of this mode, which will also make it drop a shiny. This is a lengthy piece, and I hope you’ve found the monster and status information helpful. Next week I’ll be discussing the Seltas Queen, who is much tougher than her male counterpart. Previous PostBeasts of Monster Hunter 4 Ultimate: NajaralaNext PostXenoblade Novelisation: Save the Girl!